Nestled in a beautiful wooded area of the Canadian Rockies, Alpine Village is ideally situated across from the sparkling Athabasca River in Jasper National Park. Forty-eight cabins are spaciously set in a natural pine forest of 11 acres located 2km south of the Jasper Townsite. Alpine Village boasts a panoramic view of the Athabasca River with Mount Edith Cavell towering in the background. The accommodations were superb. You have managed to please our entire family from ages 14 – 56. The scenery, the setting, everything is gorgeous! You even provided the elk on schedule! Best wishes for your continuing success in the business! Alpine Village offers seasonal accommodation, from May to October, which range from one room cabins and bedroom suites, popular with couples and honeymooners, to deluxe one bedroom, family and new executive one-bedroom cabins, all of which provide superior accommodation with the perfect blend of comfort and seclusion. Our cabin resort features natural pine log cabins, both exterior and interior, and this theme is carried throughout the Village, including the pine furnishings. Cabins are tastefully appointed, each with its own special decor. 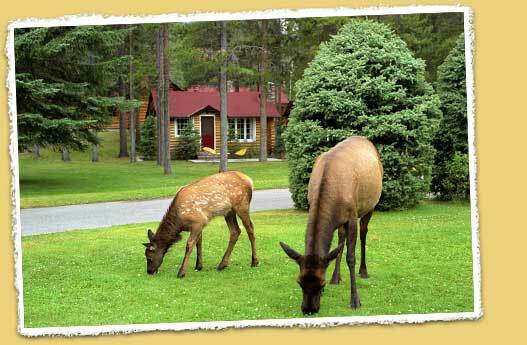 Soak in our luxurious outdoor 16 ft. hot pool, breathe in the exhilarating mountain air and catch a glimpse of an elk as you stay in your own log cabin in the Canadian Rockies. 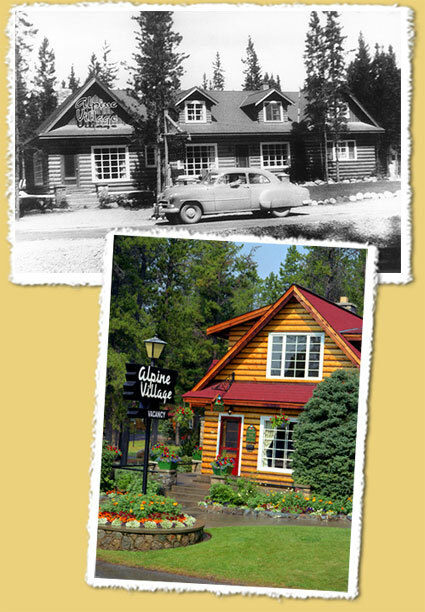 The current owners of Alpine Village, the Allin family, acquired the Village in 1986. 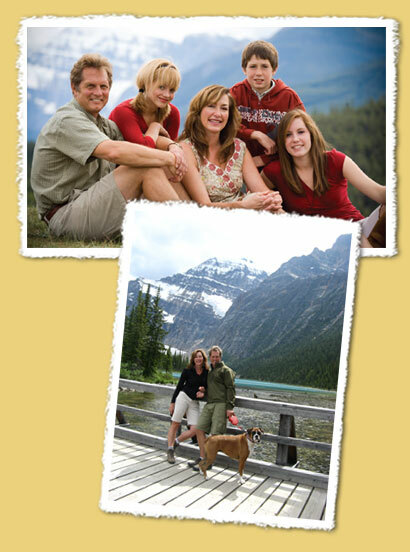 The Allins had been coming to Jasper for over 30 years and had always admired Alpine Village by the Athabasca and recognized it as one of the best located and maintained resorts in Jasper. The original builders of the resort were Curt and Mary Kiefer, who commenced building 30 units in 1941. It opened for its first official season in 1946 just after World War II and was named Kiefers Kozy Kabins. Once the opportunity to purchase Alpine Village came up in 1986, the Allins have been expanding and improving the resort ever since. The first expansion to take place, was the 1989 construction of six deluxe one bedroom cabins, with prime views of the Athabasca River and Mt. Edith Cavell. Six deluxe bedroom suites, with fireplaces built with the marble from the old Tegler Building of Edmonton (for years the tallest building in Edmonton), were also completed in 1989. In 1994, the outdoor hot pool with its spectacular view of the Athabasca River valley was added and has been very popular with guests, especially after a long day's hike. In 2004, the original 60 year old two-bedroom cabins were completely rebuilt with a 2nd floor and open loft to become the family cabins allowing for bigger bathrooms and modern kitchens. This renovation was so successful that Alpine Village won the Jasper National Park Heritage Tourism Award 2004 in Heritage Architecture for maintaining architectural motif and design. In Spring 2009, six new deluxe bedroom suites were added that offer a romantic choice for honeymooners with a king bed facing a large corner fireplace. Renovations and new additions are always ongoing. In 2012, three new deluxe family and two fabulous executive one-bedroom cabins were constructed at Alpine Village plus in 2018, the seven Whistler one bedroom log cabins were built and opened up to guests. Renovations and new additions are always ongoing, and in 2012, three new deluxe family and two fabulous executive one-bedroom cabins were constructed at Alpine Village. All the cabins are designed and renovated to maintain the unique character of the resort, and to further enhance the comfort and enjoyment of guests staying at Alpine Village. The Allins, Chris and Rena, their three adult children and their committed staff continue to operate the resort, truly enjoying the vast array of experiences and meeting of new people that make running the business so rewarding. They look forward to welcoming guests to Alpine Village in beautiful Jasper National Park, one of the most beautiful locations in the world. Travellers world-wide have consistently commended Alpine Village with the highest ranking of "#1 Place to Stay in Jasper National Park" for many consecutive years. This prestigious award is recognizing Alpine Village for receiving the “Certificate of Excellence” Awards for five consecutive years of 2011 -2017. It recognizes the high praise from travellers to acquire a 4.5 rating. Alpine Village was selected and are repeat winners for this award by the millions of travelers who provide their real and unbiased reviews about hotels on tripadvisor.com. Alpine Village was honoured to be recognized as a tourism business or organization that best captures the essence of an Alberta vacation experience . . . the historical authenticity of their log cabin resort. Alpine Village was one of three finalists in this prestigious award that honours an organization in the tourism industry that demonstrates a commitment to service excellence, delivering outstanding customer service to their visitors, employees, suppliers and other stakeholders. Alpine Village’s Housekeeping staff have repeatedly received this award from 1988-2018 for excellence in cleanliness and maintenance of guest cabins. For excellent human resource practices in the hospitality industry in the province of Alberta towards their employees. 2012 - 2016 Award Nominee For excellence in property landscaping and display of flowers and blooms. Three-Diamond CAA/AAA (Canadian and American Automobile Association) Approved Accommodation. Alpine Village has maintained this rating consistently throughout the years. Awarded and recognized as excellent employers in Jasper, Alberta who provide a fun, caring work environment for their seasonal employees. Jasper National Park "Heritage Tourism Award 2004" in Heritage Architecture for maintaining architectural motif and design in the renovation of six 60 year old two-bedroom cabins at Alpine Village. Alpine Village is a highly recommended accommodation in numerous travel publications, guide books and internet listings such as Fodor's Canada Travel Guide, Frommer’s Banff and Jasper National Parks Guidebook, Lonely Planet Travel Book, Rocky Mountain Retreats, The Top 100 Most Beautiful Rustic Vacations, Treasures of Alberta and numerous newspaper write-ups. “Come here for understated luxury and solitude. Staying in one of these cabins will make you dream about the cottage you’ve always wanted. "One of Jasper's bargains is just south of the town. Logs in many cabins are left exposed on interior walls, adding to the warm, rustic feeling of this family-run operation. Rooms have pine furnishings, fieldstone fireplaces, and beamed ceilings. Most units have sundecks; deluxe family cabins have full kitchens. Mt. Edith Cavell rises in the distance, and the Athabasca River runs out front."